The headjoint is the most important factor in determining the tone. 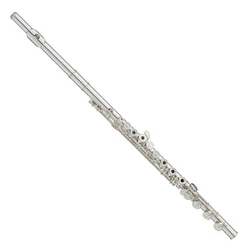 The Yamaha 300 Series flutes feature, at a very affordable price, a headjoint of 92.5% pure sterling silver, and a nickel silver body and foot for a dark warm tone. Featuring a double flare taper and a unique embouchure hole undercut design for excellent response and a warm rich tone, the CY headjoint helps beginners quickly learn to produce a beautiful sound. More advanced players will appreciate its even, quick response in all registers. Key posts have been thickened and redesigned for improved durability and strength to maintain accurate rod alignment. All key shapes and placement have been ergonomically designed for a comfortable, natural-feeling performance. The keys are hand-assembled and adjusted for perfect balance and 'touch'. Yamaha's unique screw resistance inserts allow smooth adjustments while preventing gradual loosening of the screws. For easier access, the screw positioning has been changed. Footjoint alignment marks facilitate proper fitting by young players.